If you're not sure whether you want to complete a full CBT or not, then why not try one of our hour long 'taster sessions'. For just £25 you can have an hour long session to just 'get you going'. 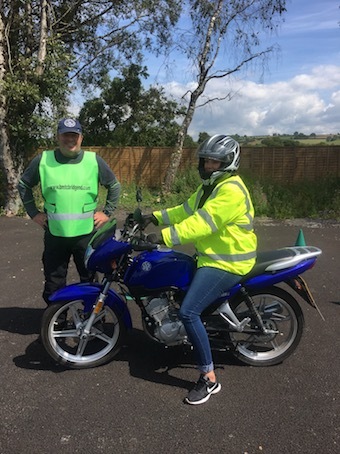 We emphasise that this is not a structured lesson as such, but is designed to give you a taste of what you are likely to experience on the CBT course and to get you riding. Yes, we can do it in just an hour!! We also recommend a taster session for those who are intending to complete a CBT but have never ridden before. By undertaking an hours training the 'taster session' just prepares you for your CBT and will make your day a far more enjoyable experience as you will have some basic control and knowledge of the machine, especially if you are intending to ride a geared machine and have never done so previously. If you have completed a 'taster session' prior to undertaking a full CBT course and still require extra training to complete the modules of the course then we shall provide up to three hours further training at no further cost should it be required. 110817:KAYLEIGH: "HAVING NEVER EVEN TOUCHED A MOTORBIKE, THIS WAS A GREAT WAY TO GET STARTED AND BUILD UP A LITTLE CONFIDENCE. 1-2-1 TUITION WAS FANTASTIC AND FRIENDLY. I REALLY RECOMMEND THOSE THAT HAVE BEEN IN MY SITUATION, WHO ARE THINKING ABOUT DOING THEIR MOTORBIKE TRAINING - HAVE A TASTER SESSION FIRST! ABSOLUTELY WORTH IT". After just half an hour on a taster session this is what one of our most recent trainees achieved. CBT course is the next step!! Take a look at this short video clip.